Apple hasn’t ever really been that afraid of cannibalizing sales of its own products, so long as customers are still buying hardware from Apple and entering its ecosystem. We knew that back when Apple first introduced the iPad and folks were worried it would cannibalize sales of Macs. Now it seems that folks are picking up iPhones over the iPad. Pocket, maker of the popular application that allows you to save articles for viewing later, recently published statistics that suggest consumers are using their larger-screened iPhone 6 and iPhone 6 Plus to consume content, versus an iPad. The same isn’t true for the iPhone 5s over an iPad, which suggests there’s some cannibalizing going on. 55 percent of consumers who own an iPhone 5s are consuming Pocket content on their phone, while 45 percent of those owners choose an iPad. Conversely, folks 72 percent of iPhone 6 owners choose their phone to read content versus 28 percent on an iPad, and 80 percent of iPhone 6 Plus owners pick up that phone versus an iPad (20 percent). 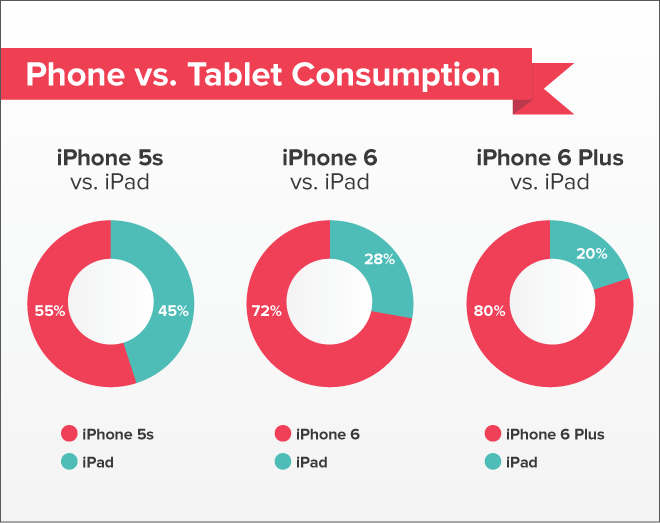 That’s not much of a shocker, as an iPhone 6 Plus owner myself, I find I rarely reach for my iPad mini anymore. The screen is large enough for me. “The bigger your phone is, the less you’re going to use your iPad,” Pocket said. “Users with an iPhone 6 now read on their tablets 19% less during the week and 27% less over the weekend. Those with a 6 Plus are on their tablets 31% less during the week and 36% less over the weekend.” The company said that nighttime reading is still most frequently done on an iPad, however. “That being said, there remains one place where tablets still hold reign: your nightstand. Regardless of which iPhone they have, users still reach for their iPads around 9pm for some late-night, bedtime reading,” Pocket explained. Will Apple worry? As long as it’s selling one product, whether it’s an iPad or an iPhone, we doubt it, but it will likely continue to contribute to the decline in iPad sales. Keep in mind that the nightstand scenario described above, however, still stands as at least one reason to buy an iPad, too. Still, perhaps this shows why Apple needs to revitalize its iPad lineup with something more compelling. iPad Pro, anyone?